In this chapter, I explore a technique that I call the ‘opera thought bubble’. This is an analogy of the cartoon thought bubble (as opposed to a speech bubble); see this example from Family Guy, in which we see illustrations of what each character is thinking, and the final thought bubble in the clip includes dialogue, which itself references the thought bubble. A similar technique is used in film to indicate an internal thought, a character’s inner monologue: the camera lingers on a close-up of a character, while simultaneously we hear their recorded voice speaking their thoughts. Take for example this scene from Christopher Nolan’s film Memento (2000), in which the main character, Leonard, comments on what is happening in the scene in real-time. We do not see his lips move, nor does he break out of the scene to address the the viewer. These are the private thoughts of the character we see on screen, on which we are eavesdropping; this is not a narration to the audience. Much of Kane’s text in 4.48 Psychosis is in a similar mode. Scenes 2, 5, 7, 11, 13, 15, 17, 18, 19, 21 and 24 fall wholly or partly into this category. They are musings, argumentations, memories, internal dialogues. They are not direct dialogue with another character, nor declamations to the audience. In these moments of 4.48 Psychosis, the objective was to create some kind of equivalent to the internal monologue scenario described above in Memento. The audience should hear the thoughts of the body on stage, without interpreting this as narrative realism or as declamations that could be heard by the other bodies on stage. Like in Memento, the same voiceover technique was used, whereby we hear a recording of Gwen’s voice speaking her thoughts. However, on stage there is no possibility of close-up shots or moving focus; the link must be made between the voiceover and the body in another way, to make it clear whose thoughts we are hearing. This is the opera thought bubble – a character sings wordless musical phrases on stage and we hear their recorded voice speaking their thoughts. I will describe two examples from scenes 5A and 18, illustrating varying gestural association and synchronisation between live voice and spoken voiceover. It wasn’t for long. I wasn’t there long. But drinking bitter black coffee I catch that medicinal smell in a cloud of ancient tobacco and something touches me in that still sobbing place and a wound from two years ago opens like a cadaver and a long buried shame roars its foul decaying grief. This text describes a location (I wasn’t there long) of a past event, in the past tense; it sets the scene for a memory. The text that follows this excerpt is the memory re-lived. It is distinctly different to this opening paragraph: it is uniformly indented further into the page, it is in the present tense, it is much angrier. (Kane frequently uses varying levels of indentation in 4.48 Psychosis, as a way of fragmenting the text to indicate different voices or perspectives.) Therefore, it made sense to divide Kane’s scene into two sub-scenes, Scene 5A and Scene 5B. Scene 5A is in the timeframe that we see on stage, setting the scene for the memory that we re-live in the present tense in Scene 5B, which is discussed in the Chapter 7 – Tape-cutting. Each fragment was recorded individually in the studio as spoken text, spoken by Gwen, and then treated to narrow-band EQ filter and light distortion to make the sound reminiscent of a small cassette recorder. These fragments constituted the voiceover part, in 21 audio cues. Short vocal phrases, mainly hummed, were written to accompany each of these cues. The vocal phrases were to be sung live by the performer, at the same time as the pre-recorded text was played back. These phrases are shown in the table in Figure 13 and in situ in the score excerpt in Figure 14. The vocal fragments begin very simply in the lower register and gradually become more elaborate and higher in the tessitura through the scene (see rehearsal letters 5A to 5D). Where a word or phrase repeats, so, approximately, does the musical phrase (e.g. I catch; something). The vocal phrases are intercut with recorded breathing sounds, so they sound like relaxed exhalations (marked on the score as inhale (up-bow symbol) and exhale (down-bow symbol)). 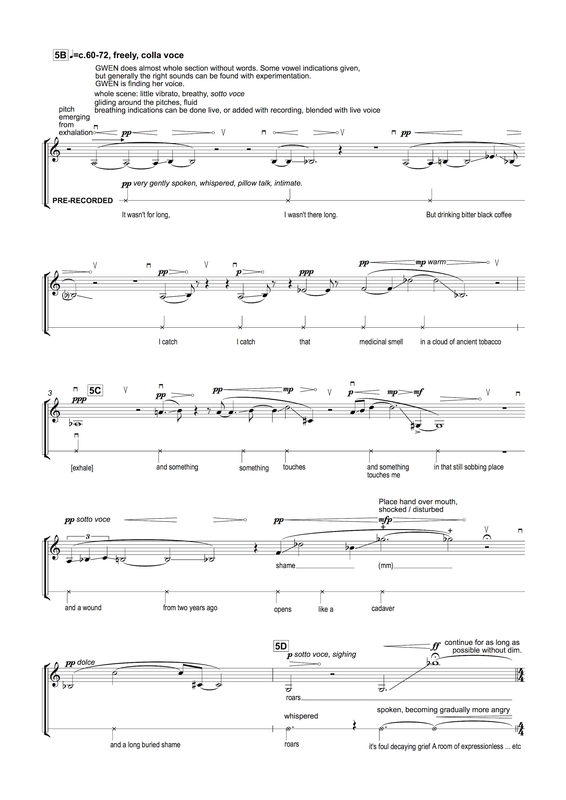 One variation to this system was made: on the words opens like a cadaver, the single word shame was sung, rising to a high G-flat, the highest note in the scene and the climactic point. The closed-mouth ‘m’ at the end of the word was held to seamlessly merge into a return to the hummed sound. This scene was in free tempo; the Deputy Stage Manager (DSM) cued each voiceover fragment by following Gwen colla voce, with help from the conductor. Despite the joined musical phrases shown above, the corresponding pre-recorded phrases remained as separate audio cues so the that DSM had maximum control over the pacing of playback. In other words, ‘medicinal smell‘ was a separate cue to ‘in a cloud of ancient tobacco‘, even though they were to be played back during a single sung phrase. Likewise for ‘opens‘, ‘like a‘, ‘cadaver’. Some time was spent rehearsing the cueing of the recordings colla voce with Gwen, the DSM and the conductor; it was vital that they were cued ‘musically’, with a sense of poise and feeling. The audio cues were channeled through the on-stage speaker so that the sound source was as close to the performer as possible, with the aim of ensuring the audience interpreted the voiceover and the performer as connected entities. This proximity of sound source and the close synchronisation between voiceover phrase and sung phrase established clearly the mechanism of the ‘opera thought bubble’ in Scene 5A. This allowed a later scene, Scene 18, to develop that mechanism, attempting to break the direct synchronisation between voiceover phrase and sung phrase. Having set-up the notion of ‘hearing thoughts’ in Scene 5A, as expressed by a direct synchronisation between a voiceover phrase and a sung phrase, in Scene 18 I attempted to break that synchronisation but still maintain the dramaturgical connection between recorded voice and live singing voice. – At 4.48 when sanity visits for one hour and twelve minutes I am in my right mind. When it has passed I shall be gone again, a fragmented puppet, a grotesque fool. Now I am here I can see myself but when I am charmed by vile delusions of happiness, the foul magic of this engine of sorcery, I cannot touch my essential self. Why do you believe me then and now? Remember the light and believe the light. Nothing matters more. Stop judging by appearances and make a right judgement. – It’s all right. You will get better. – Your disbelief cures nothing. The dashes in the left margin indicate a dialogue scene between patient and doctor, as in scenes 1, 6, 10, 12 and 23 discussed in Chapter 8 – Percussion Dialogue scenes. 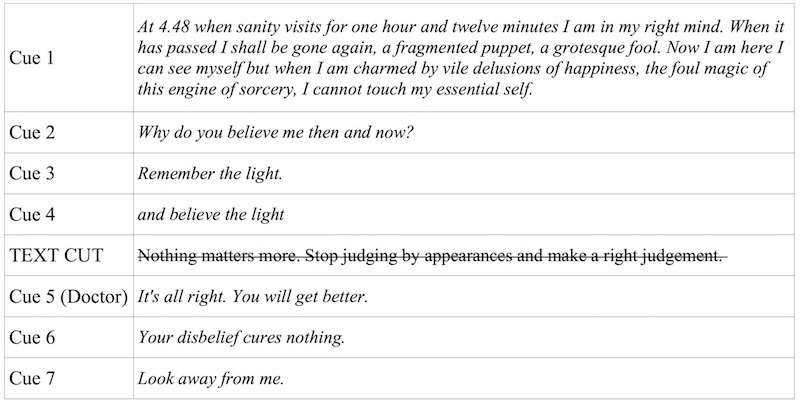 However, despite Kane’s dashes, most of this scene is actually monologue by the main character, and the content is very similar to Scene 2 (‘Remember the light and believe the light‘) and Scene 21 (‘At 4.48 I shall sleep‘) both of which reference themes in Scene 18 with the repetition of Remember the light and believe the light and the refrain of At 4.48. For these reasons, Kane’s dashes were ignored and Scene 18 was set as a solo scene for Gwen, and re-framed as an internal monologue. The same thought-bubble technique was applied as in Scene 5A, but in contrast to that scene the spoken text was not broken into fragments. Breaks for new cues were only made where there are line breaks in Kane’s text, as shown in Figure 15. One sentence was cut. Vocal phrases were written for Gwen in a solo scene, to be hummed live, exactly as in Scene 5A. These consisted a repeated rising two-note phrase with a glissando in between, and treated to small variations through the scene. There was no direct synchronisation between sung phrase and pre-recorded spoken cue. 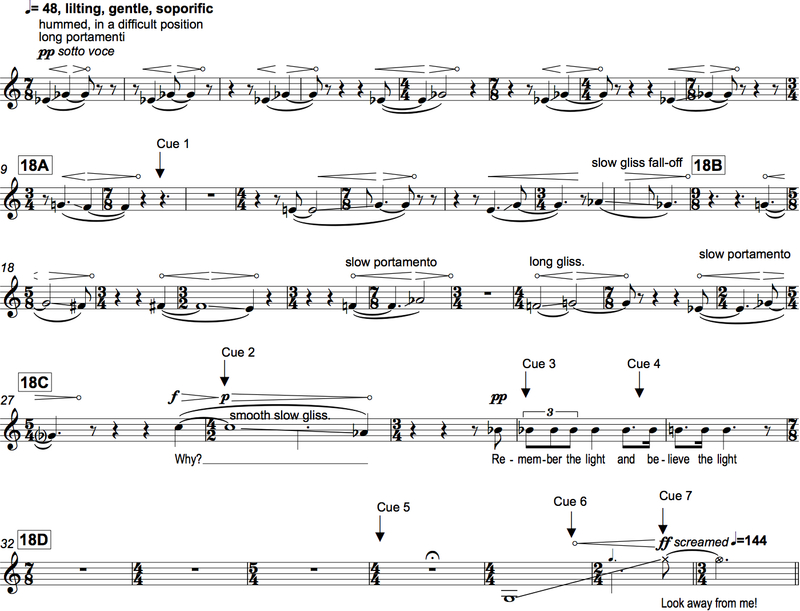 Gwen’s melodic line in this scene is shown in Figure 16, along with the cue points where each pre-recorded spoken text cue is triggered by the DSM. The repetitive vocal motif is established with seven iterations before the first spoken text cue is triggered. The ensemble music supporting this consists of sustained chords built on perfect fifths a third apart, in strings and piano, with strings slowly sliding between chords. All musical phrases are hummed, with the exception of two important lines in which Gwen voices the words alongside (but not synchronised with) the pre-recorded spoken text: Why? (bar 28) and Remember the light and believe the light (bar 30). These words were chosen as the most dramaturgically important in the scene, and therefore treated differently. At these points the duplication of words across sung voice and spoken text further reinforces the dramaturgical link between the spoken voice and the sung voice – it tells the listener that we are hearing this person’s thoughts. These sung phrases were further differentiated by sitting higher in the tessitura on pitches C and B-flat respectively, which have not previously been heard in the voice in this scene, with accompanying harmonic changes in the ensemble. It is also interesting to note that the Doctor’s sole phrase in bar 35, ‘It’s all right, you will get better‘, is triggered in a general pause – only the accordion holds a chord from the previous bar – and the cue is not linked to a sung phrase by the performer. This spoken phrase is pre-recorded by Lucy, the character that most often plays the role of Doctor in other scenes. However, Lucy may or may not appear on stage at that point, so her pre-recorded voice may exist in reality (if she is present) or in Gwen’s mind (if she is absent); this musical setting leaves that choice open for the director to address. I have discussed two examples from the opera of how pre-recorded voice can be interpretatively linked to a performer on stage by matching it up with the sung voice, either directly synchronised (Scene 5A) or not (Scene 18). This ‘Opera Thought Bubble’ enables us to portray the inner monologue of a character – something that Kane calls on theatre makers to do frequently in 4.48 Psychosis. However, there are also passages of Kane’s text that clearly indicate third party voices. For some of these passages I have also used voiceover techniques, which are described in the next chapter.